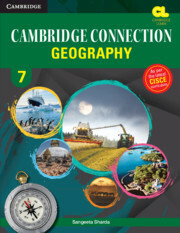 Cambridge Connection: Geography (ICSE) is a series of textbooks for classes 6 to 8. Cambridge Connection: Geography for ICSE Schools is a series of textbooks for classes 6 to 8, conforming to the new curriculum released by the Council for Indian School Certificate Examinations (CISCE). The three-level series deals with the systematic study of the physical and regional geography of each continent and that of India in the case of Class 8. This series will not only prepare the learners for the more detailed study of Geography in the high school but will also motivate them to learn more about the world around them.